This isn’t the first AK-to-somewhere-in-Europe rumor we* have seen. *By “we,” I mean “I,” unless you are also crazy enough to be doing Google News searches in languages you don’t read or speak. So far this offseason, there have already been reports (link in Russian) that Andrei received a 2-year, $12.5 million offer from Russian ball club Spartak St. Petersburg, which also happens to be the first professional basketball team AK ever played for…which he did at the tender age of 15. Andrei Kirilenko with his talent, experience and energy are able to successfully pursue a career as a club in the NBA and Europe. But we must proceed from the desire of the player. We have repeatedly talked with Andrew recently, and as far as I know, its priority-the NBA. Although Victor Khryapa would be happy to sign the CSKA his friend, with whom they have long dreamed to play together. There’s also been reported (in Turkish) interest from Enes Kanter’s former team (and Gordan Giricek’s most recent team), Fenerbahce. Today, I think, we move from speculative reports to semi-concrete stories. C has been sending me bits and pieces from Spanish sports newspaper Marca in the past few days. She got them from the .pdf versions of the paper, so I don’t have links. El último en saltar a la palestra fue Andréi Kirilenko. 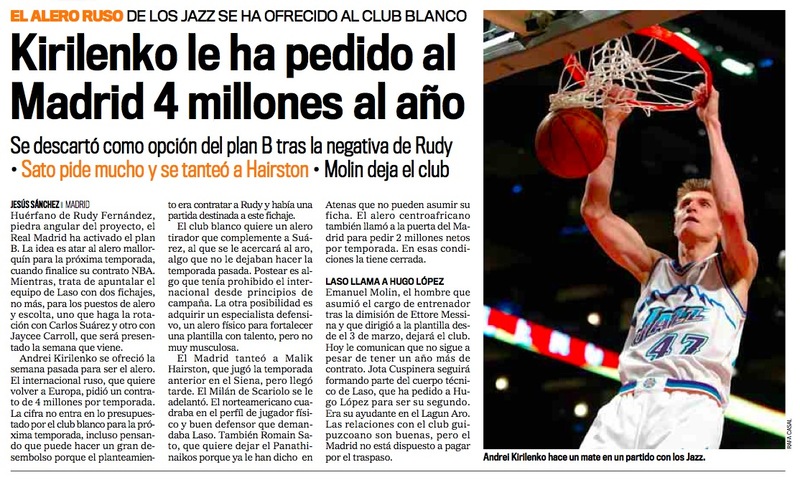 El ruso, tras jugar 10 años en Utah Jazz, asegura que le gustaría jugar en España: “Es la Liga más fuerte del continente, sería interesante probar allí. Además, si el lockout acaba, yo no tendría que volver a la NBA porque soy agente libre”. Pese a todo, no se moja: “Mencionar un equipo es prematuro, mi agente me presentará una lista con ofertas en dos semanas”. Andrei Kirilenko offered last week to be [Real Madrid’s] forward. The Russian international, who wants to return to Europe, asked for 4 million euros per season. The club doesn’t have that much in next year’s budget, even though they had set aside a quantity to sign Rudy [Fernandez].